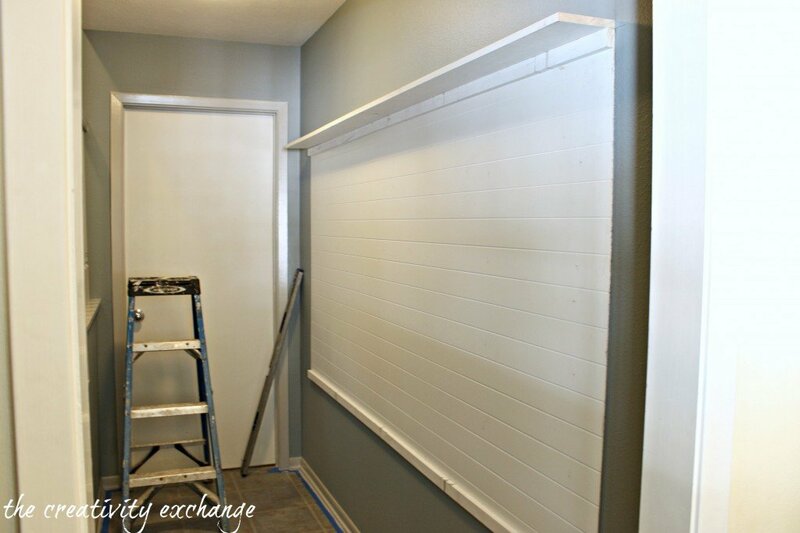 I’m back today as promised on Wednesday’s post, to go into the details/tutorial of our DIY mudroom that turned out to be a life saver for us. 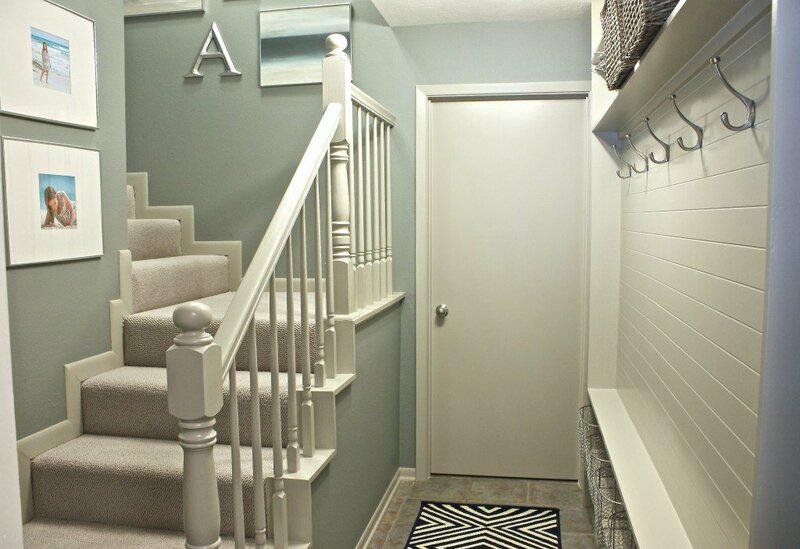 For those of you who missed it on Wednesday, I shared the pictures of our stairwell/mudroom revamp project. 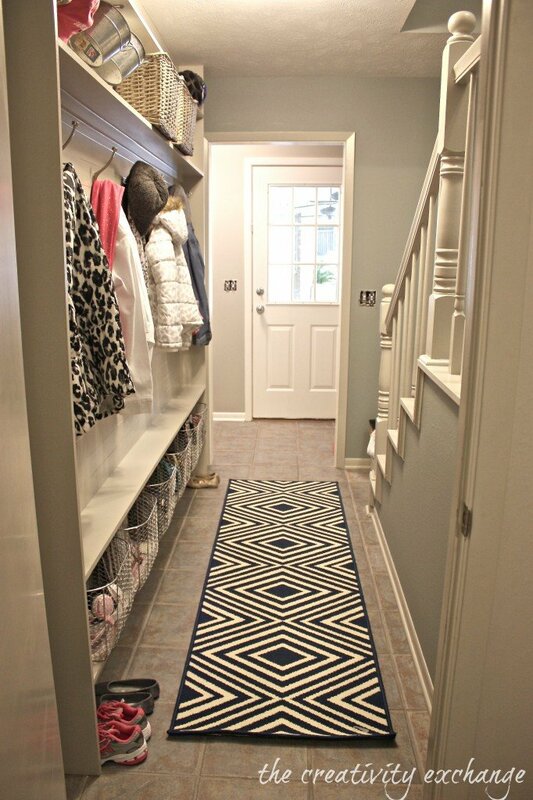 My biggest challenge for this space was trying to figure out a way to incorporate some sort of mudroom into this narrow hallway. 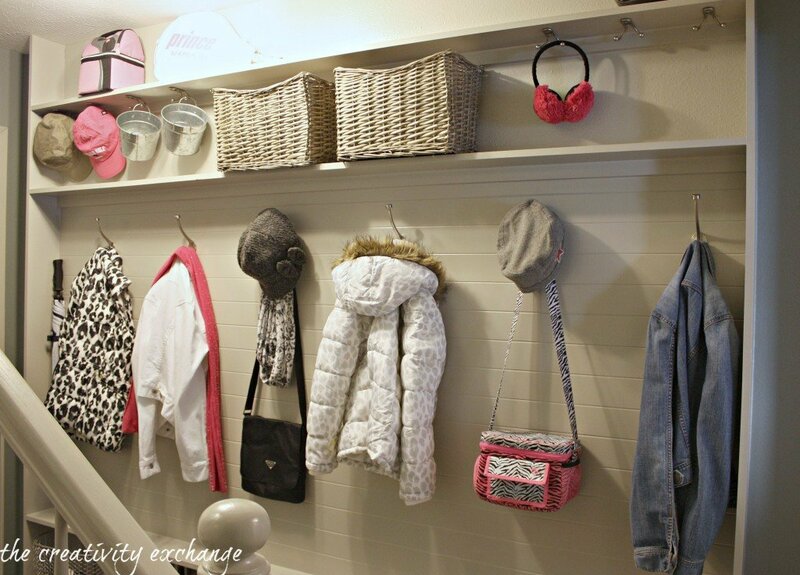 This hallway is right by our back door to our garage and we desperately needed a spot to hang jackets, backpacks, hats and baskets for little things. 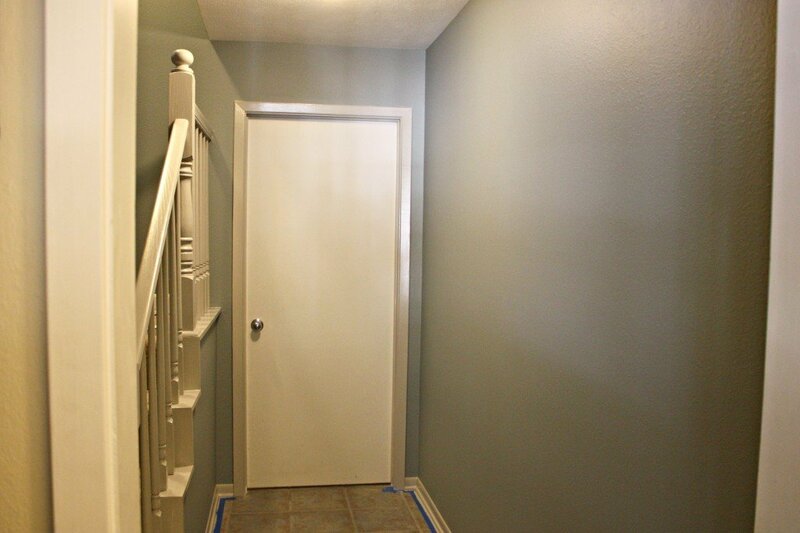 The hallway is super narrow and measures approximately 42″ or 3 feet x 6 inches. Yep, not much to work with. On the front end of this revamp project, I knew that I didn’t want to simply put hooks on the wall but rather I wanted a really pretty piece that looked built-in and finished. I didn’t want to spend a whole lot of money of the piece as well. I also needed shelves for baskets and additional storage for us to drop and store little stuff like scarves, mittens (which we rarely need in Texas), flip flops, travel bags, headphones, ect.. 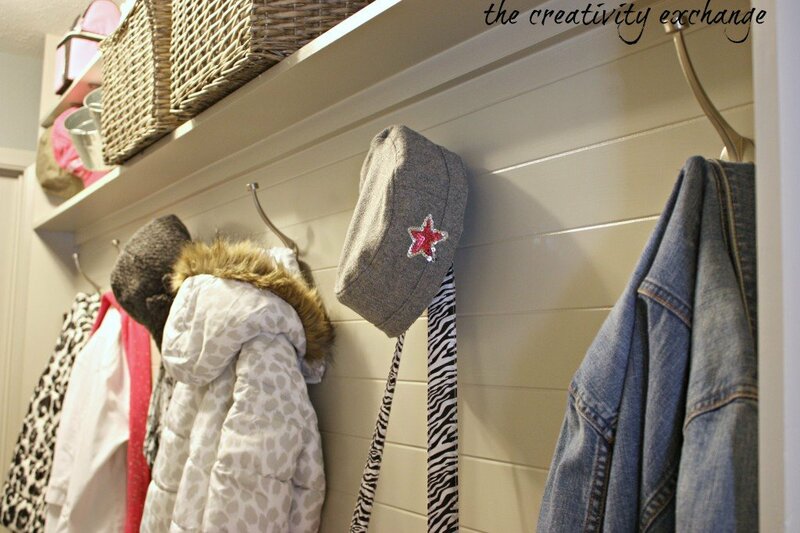 So, we came up with a plan to do this pretty built-in mudroom wall, which turned out to be a very inexpensive, functional and beautiful solution for us. This project was done under $150.00!! 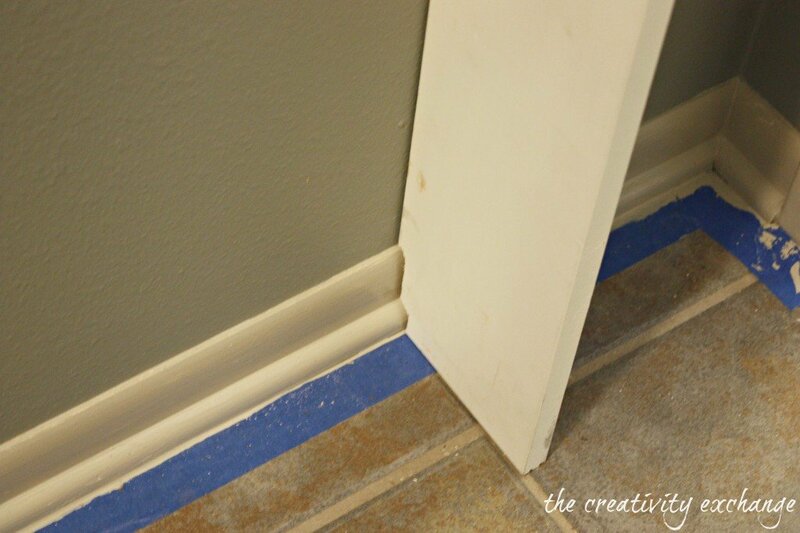 The measurement of the wall to the inside of the door frame is about 5- 1/2 inches. We knew that 1 x 6 pine actually measures 5 -1/4th, so we came up with our plan. 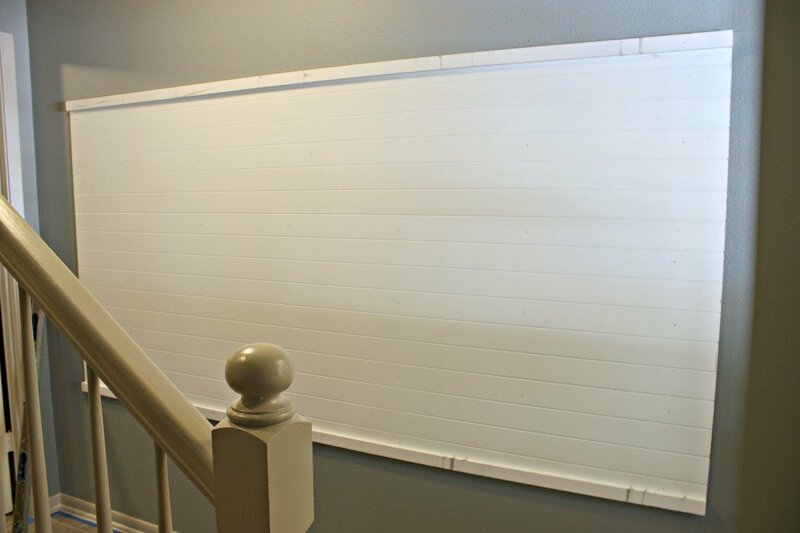 Bead board paneling is 8 ft. x 4 ft. and we turned the paneling on the side, so the grooves are going horizontal, which was perfect because the length of my hallway is over 10 feet. As you can see, by turning the paneling on the side and centered on the wall, it’s exactly about how much space we needed for the coat and hook part and then the edges top and bottom were the natural place to begin the shelves. 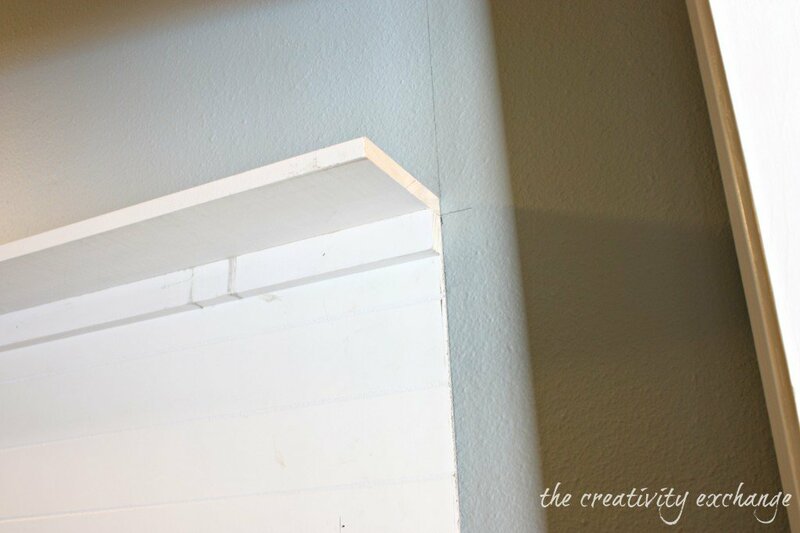 We purchased our paneling from Home Depot and this is link here for what we used. On the top and bottom of the paneling, we nailed 1 x 2, which would eventually be our shelf brace. We nailed it onto the paneling to help secure the paneling as well (rather than the wall). Because we wanted the piece to look like a built-in, we only painted the piece itself and the inside of the shelves in the Mindful Gray. We left the wall on both sides of the piece my blue/green wall color. Remember when looking for storage pieces to consider anything! 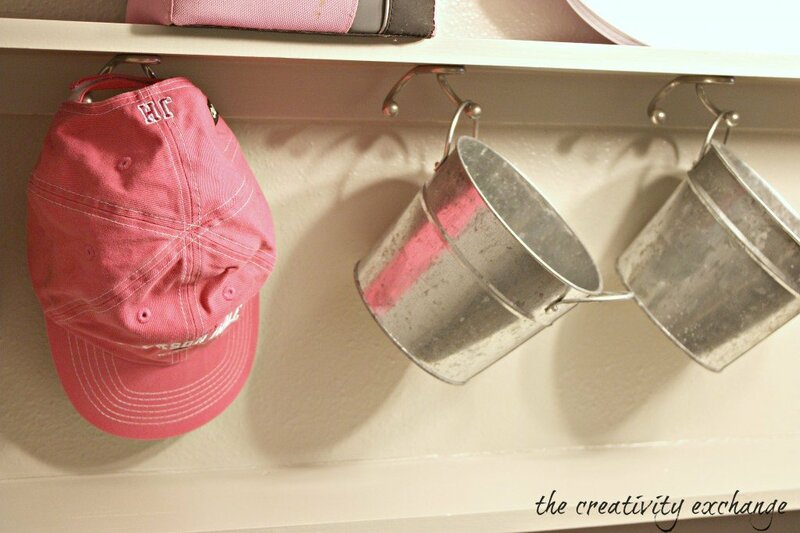 With a can a spray paint, anything can work! I hope I’ve explained all of the details clearly. If you have any questions, please leave them in the comment section and I will get back with you with any additional details. I’m thinking that maybe I need to draw up a plan or something. If you would like a plan, let me know and I have enough people who want one, I will do that. Before I close, I have to mention again that I do not do these big projects alone and have great help with a contractor friend Jesus Terrazas, who helps me with my grand, crazy plans. I am really fortunate to work with him because he has taught me so many tricks each step of the way and ways to save so much money on these projects. Since my husband doesn’t want anything to do with DIY have the time, over the years Jesus has become my DIY partner and helps me with the big stuff. Thanks so much to Jesus!! Looks amazing!! Love it. Great job. I think it’s great inspiration for many hallways that could be utilized better. Very creative. I love this!!! Can’t wait to get started on it! 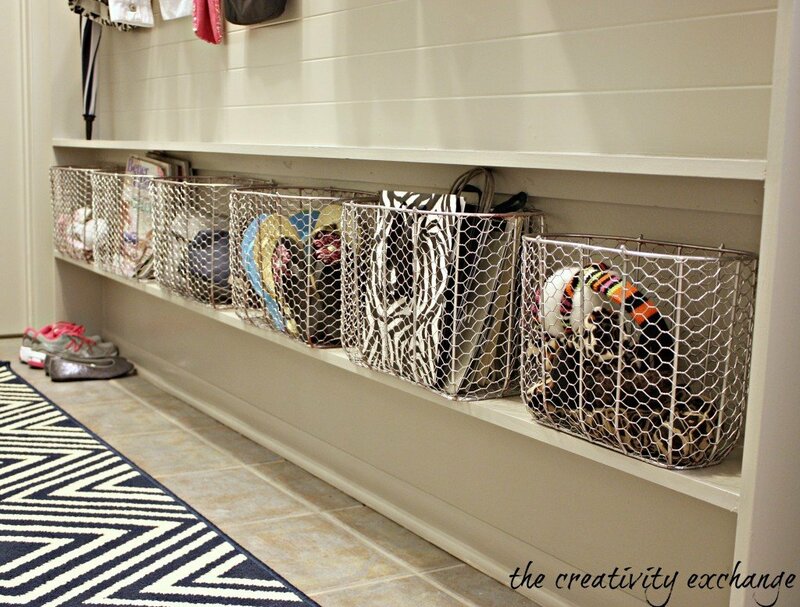 This is a perfect solution to my narrow small hallway (48″ long X 42″ wide) from the garage to the kitchen! I have been searching and searching for something that wouldn’t cause a further narrowing of the space. Thank you so much for your clever design! Question: did you use 1″x6″ furring strips, or the better (and more costly) kiln-dried whitewood, or something else for the shelves? What does Jesús recommend? Came out really well, and kudos to you on your measurements and space planning! Love those baskets to hold ‘stuff’! 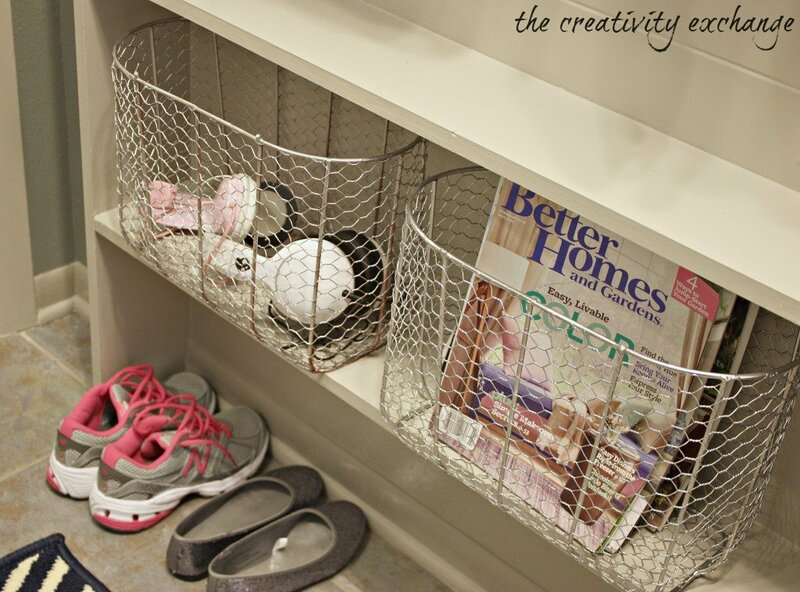 Thanks for mentioning the wire baskets were found at Hobby Lobby! 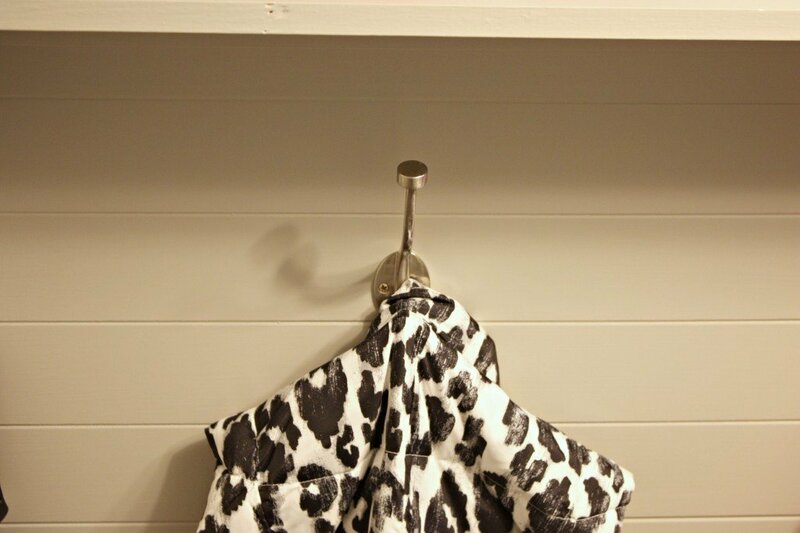 AND love how you put up the panel of beadboard to make a more durable surface behind the hooks. Great make over! And so useful! Our master bedroom is Mindful Gray. Such a pretty shade. I really like it in combination with your blue/green wall color and have been looking for a similar one for our master bath. Could you tell me what that soothing color is please? Thank you kindly! I am impressed….again! This looks amazing Cyndy!!! This looks great, you did a fantastic job on it. I love the rug, where did that come from? Great use of a narrow space! I’m especially loving the storage baskets on the bottom shelf. And I’m going to have to find a measuring tape that goes on my key chain, genius! You said that Jesus helped you with this . . . . . well he was the son of a carpenter, so I think he’d be a good choice for a helper! Amazing! Where did you get that rug? Beautiful — I also love the rug. Where did you get that at?? Great use of space! I’m with Cindy, and LOVE the rug!!! Looks awesome, where u get that rug?! Thank you, thank you, thank you!! 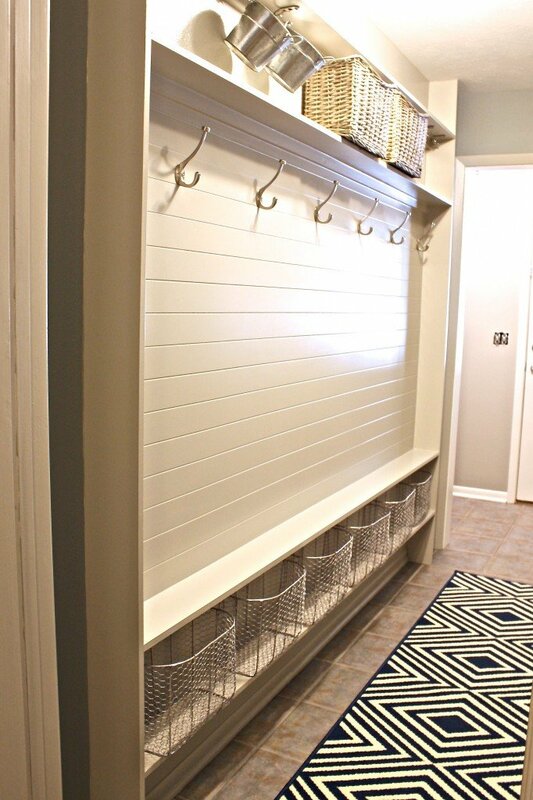 I have been searching for a narrow mudroom idea forever. I love this and think it will work for our space. 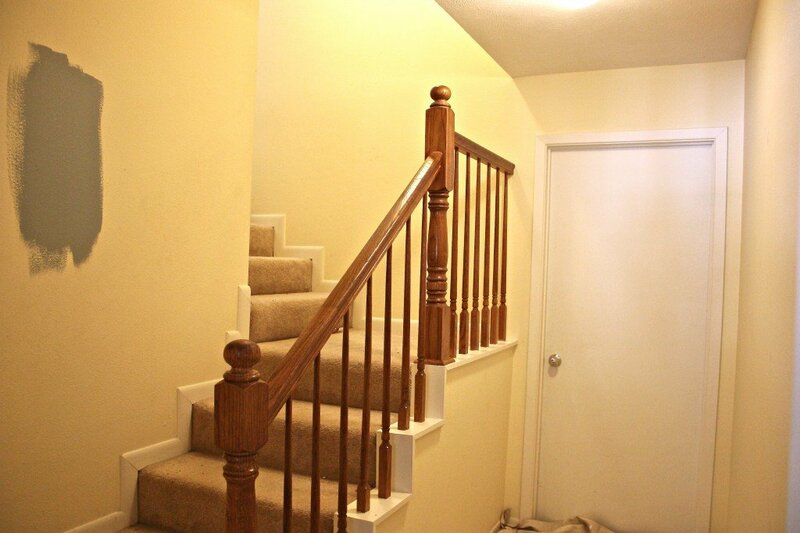 We have a very narrow hall leading to our bathroom (just off of the garage where we always come in and out.) Our laundry closet is in this hall, too. We already have shoe racks there that stick out nearly 11″, so this would really help to streamline the space and keep it useful. Thanks again for sharing your process! Just finished mine! Thank you for the wonderful idea!! And target sells “tank baskets” they are exactly 5 1/2″ wide perfect for the narrow shelves! I found this via Pinterest and I’m so glad I did!! I have a wall in my living room that I wanted to turn into a mudroom “wall,” but like you I only have a few inches of depth to work with. I wasn’t sure how I was going to pull it off until now! Hallelujah!! I could kiss you. Have had this same dilemma for many years now. You have saved us! Definitely going to do this!! Thanks!! great work! – where did you get that rug from!? Just finished our “wall” and it looks amazing. I can’t tell you how happy I was to find this site and this post. Love, love, love this. Do you have a parts list for everything you used for this project? A plan would be amazing – this is the perfect solution for our narrow space, too! Only took me a day and my husband was kind enough to paint it for me! I couldn’t find baskets so I bought two $10 wooden crates and cut them in half long ways then nailed on wooden back and it works out great! I also added quarter curve molding in two areas. I’d love to share pictures! Thanks for the project ! I LOVE THIS IDEA!!! Thank you for sharing! 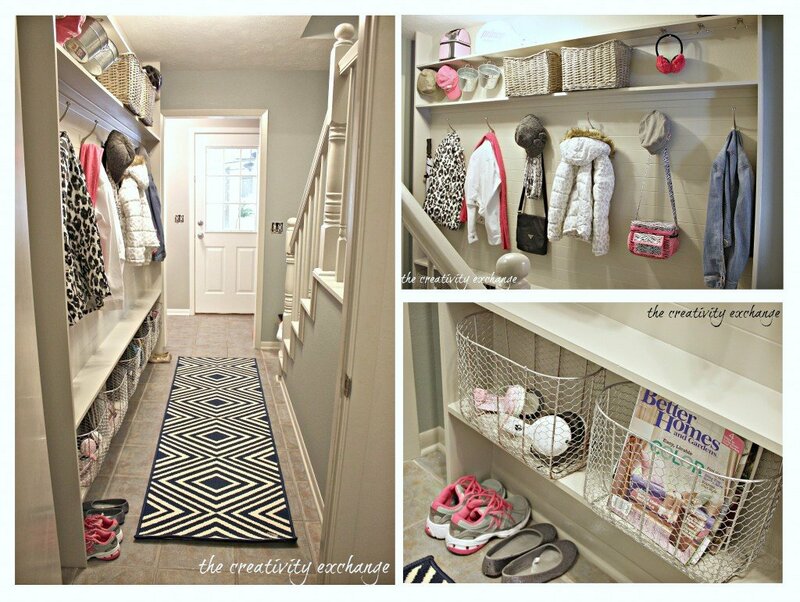 Love what you did to your entryway especially with such tiny space. My dimensions are very similar so it was great to see what could be produced and to such a superb quality. Where did you get the wicker baskets on the upper shelf? And do you have a step-by-step plan for the layout? Absolutely great project! I love it!!! Cindy – this project is AMAZING!! 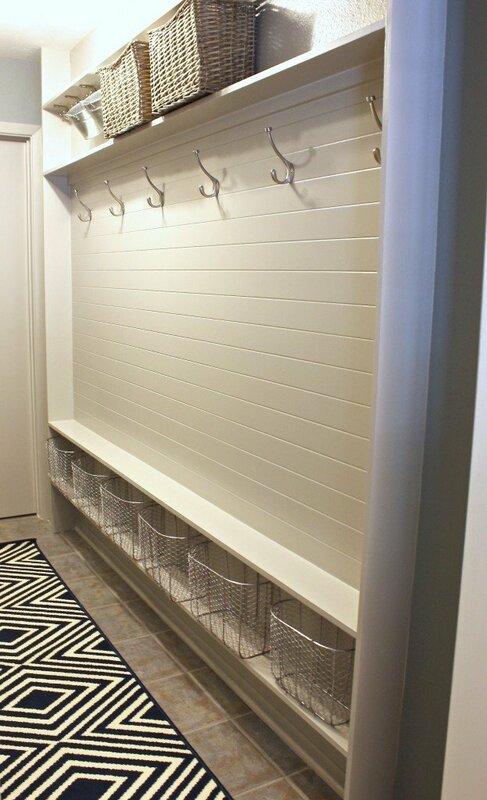 I am buying a home that unfortunately has no mud room so I was looking for solutions to turn an art niche wall in a hallway into a pseudo mudroom with hooks and possibly going into the studs so it doesn’t come out too far. You just saved me the hassle of hiring a contractor to tear up the wall!! I am definitely interested in the plans if you are willing to share. THANK YOU! This is so awesome and looks so custom. 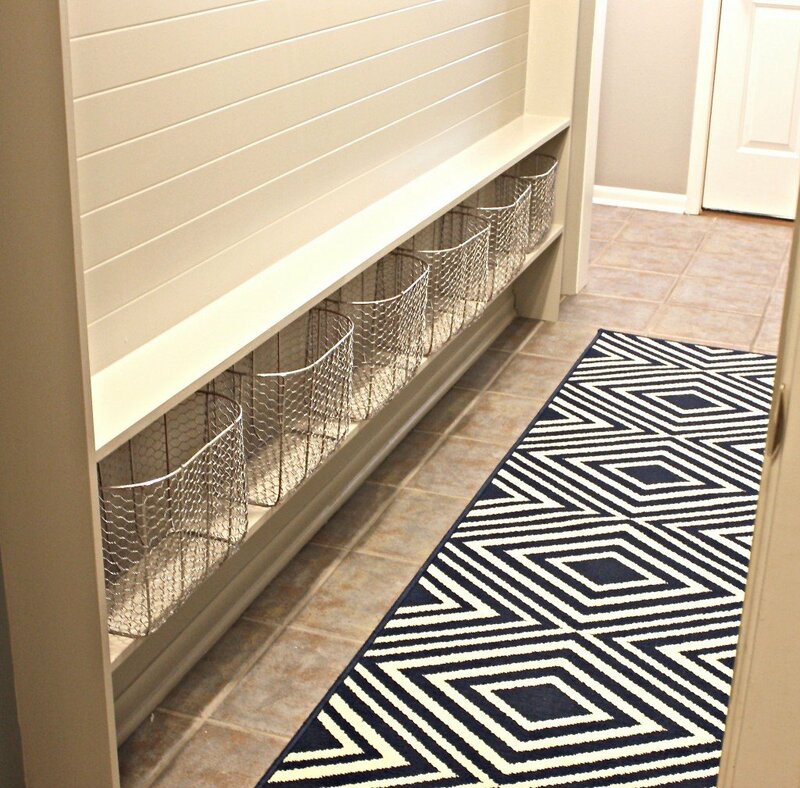 I love your narrow mudroom. We are going to try to get this done before the start of school. Do you have plans you would mind sharing?